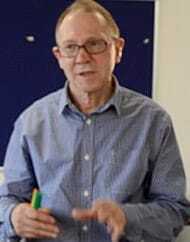 Simon is currently a Tutorial Fellow at the Sussex Centre for Language Studies. Over the years Simon has held numerous similar posts at many distinguished establishments such as the University of Southampton, the University of Reading, the Open University and Imperial College of Science & Technology. “After my diagnosis, finding AMEND and talking to another human being who knew about MTC was massively reassuring to me. This was a chaotic time medically as different specialists had competing views about treatment procedures, and I embarked on a marathon of tests that seemed as inconclusive as they were expensive. After three lots of surgery, I had little voice left and my employer had written me off. AMEND was there for me throughout this period, and I feel a huge debt of gratitude for the work it does. I want to ensure AMEND continues to be there for others. I enjoy feeling that, through the work of AMEND, I can make a difference to people’s lives in a positive and practical way.